Noise Minimization in CMOS Current Mode Circuits That Employ Differential Input Stage, YESIL, A., OZENLI, D., ARSLAN, E., KACAR, F.
Centroid Update Approach to K-Means Clustering, BORLEA, I.-D., PRECUP, R.-E., DRAGAN, F., BORLEA, A.-B. A Novel Secure and Robust Image Watermarking Method Based on Decorrelation of Channels, Singular Vectors, and Values, IMRAN, M., HARVEY, B. A.
Proportional-Integral-Resonant AC Current Controller, STOJIC, D., TARCZEWSKI, T., KLASNIC, I. Centralized Gap Clearance Control for Maglev Based Steel-Plate Conveyance System, GUNEY, O. F., BOZKURT, A. F., ERKAN, K.
SIDHARTHAN, R. K. , KANNAN, R. , SRINIVASAN, S. , BALAS, M. M.
Sensor fusion based localization techniques often need accurate estimate of the fast and uncertain scene change in environment. To determine the scene change from two consecutive LIDAR scans, this paper proposes a novel technique called 'keep zero as zero' polar correlation. As it name implies any zero in the scan data is kept isolated from scene change estimation as it do not carry any information about scene change. Unlike existing techniques, the proposed methodology employs minimization of selective horizontal and vertically shifted sum of difference between the scans to estimate scene change in terms of rotation and translation. Minimization of the proposed correlation function across the specified search space can guarantee an accurate estimate of scene change without any ambiguity. The performance of the proposed method is tested experimentally on a mobile robot in two modes depending on the scene change. In the first mode, scene change is detected using dynamic LIDAR, whereas static LIDAR is used in the second mode. The proposed methodology is found to be more robust to environmental uncertainties with a reliable level of localization accuracy. T. Bailey, H. Durrant-Whyte, "Simultaneous localization and mapping (SLAM): Part II", IEEE Robotics and Automation Magazine, vol. 13, no. 3, pp. 108-117. 2006. J. Gutmann, T. Weigel, B. Nebel, "A fast, accurate and robust method for self-localization in polygonal environments using laser range finders", Advanced Robotics, vol. 14, no. 8, pp. 651-667 2001. W. Hao, Y. Wang, X. Ning, M. Zhao, J. Zhang, Z. Shi, X. Zhang, "Automatic building extraction from terrestrial laser scanning data," Advances in Electrical and Computer Engineering, vol.13, no.3, pp.11-16, 2013. X. Ning, Y. Wang, "Object extraction from architecture scenes through 3d local scanned data analysis," Advances in Electrical and Computer Engineering, vol.12, no.3, pp.73-78, 2012. S. Bando, T. Tsubouchi, S. Yuta, "Scan matching method using projection in dominant direction of indoor environment", Advanced Robotics, vol. 28, no. 18, pp. 1243-1251. 2014. M. Ahmad Sharbafi, S. Taleghani, E. Esmaeili, "ICE matching, robust and fast feature-based scan matching for an online operation", Journal of Experimental and Theoretical Artificial Intelligence, vol. 27, no. 2, pp. 137-157. 2015. R. Lindenbergh, P. Pietrzyk, "Change detection and deformation analysis using static and mobile laser scanning." Applied Geomatics, 7(2), pp. 65-74. 2015. S. Zeng, "A tracking system of multiple LiDAR sensors using scan point matching", IEEE Transactions on Vehicular Technology, vol. 62, no. 6, pp. 2413-2420. 2013. G. Zhang, I. H. Suh, "A vertical and floor line-based monocular SLAM system for corridor environments." International Journal of Control, Automation and Systems, vol. 10, no. 3, pp. 547-557, 2012. C. Ulas, H. Temeltas, "A fast and robust feature-based scan-matching method in 3d slam and the effect of sampling strategies", International Journal of Advanced Robotic Systems, vol. 10, no. 1, 2013. A. Fernando, Auat Cheein, Ricardo Carelli, "Analysis of different feature selection criteria based on a covariance convergence perspective for a slam algorithm." Sensors, vol. 11, pp. 62-89, 2011. E. Tsardoulias, L. Petrou, "Critical rays scan match SLAM", Journal of Intelligent and Robotic Systems: Theory and Applications, vol. 72, no. 3-4, pp. 441-462. 2013. D. Z. Wang, I. Posner, P. Newman, "Model-free detection and tracking of dynamic objects with 2D LIDAR", International Journal of Robotics Research, vol. 34, no. 7, pp. 1039-1063. 2015. R. Guo, F. Sun, L. Yuan, "ICP based on polar point matching with application to graph-SLAM", 2009 IEEE International Conference on Mechatronics and Automation, ICMA 2009, pp. 1122. 2009. 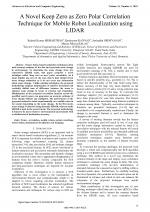 M. Mirkhani, R. Forsati, A. M. Shahri, A. Moayedikia, "A novel efficient algorithm for mobile robot localization", Robotics and Autonomous Systems, vol. 61, no. 9, pp. 920-931. 2013. J. Neira, J. D. Tardos, "Data association in stochastic mapping using the joint compatibility test", IEEE transaction on Robotics and Automation, vol. 17, no. 6, pp. 890-897, 2001. Yangming Li, Shuai Li, Quanjun Song, Hai Liu, M. Q. Meng, "Fast and robust data association using posterior based approximate joint compatibility test," IEEE Transactions on Industrial Informatics, vol.10, no.1, pp.331,339, 2014. A. Diosi, L. Kleeman, "Laser scan matching in polar coordinates with application to SLAM", 2005 IEEE/RSJ International Conference on Intelligent Robots and Systems, IROS, pp. 1439, 2005. D. Spelic, F. Novak, B. Zalik, "A fast method for the alignment of the displacement of voxel data," Advances in Electrical and Computer Engineering, vol. 12, no. 2, pp. 41-46, 2012. M. Choi, J. Choi, W. K. Chung, "Correlation-based scan matching using ultrasonic sensors for EKF localization", Advanced Robotics, vol. 26, no. 13, pp. 1495-1519. 2012. Davor Graovac, Srecko Juric-Kavelj, Ivan Petrovic, "Mobile robot pose tracking by correlation of laser range finder scans in Hough domain. ", 19th International Workshop on Robotics in Alpe-Adria-Danube Region - RAAD2010, 2010. K. Briechle, U. D. Hanebeck, "Self-localization of a mobile robot using fast normalized cross correlation," IEEE International Conference on Systems, Man, and Cybernetics, IEEE SMC '99 Conference Proceedings. vol. 4, no. 1, pp.720-725, 1999. Lei Zhang, Sung-In Choi, Soon-Yong Park, "Polar-Cartesian hybrid transforms: a novel 2d range scan registration algorithm", International Journal of Control, Automation, and Systems, vol. 11, no. 5, pp. 1001-1008, 2013. M. Altermatt, A. Martinelli, N. Tomatis, R. Siegwart, "SLAM with corner features based on a relative map". 2004 IEEE/RSJ International Conference on Intelligent Robots and Systems (IROS), vol. 2, pp. 1053-1058, 2004. T. Chai, R. R. Draxler, "Root mean square error (RMSE) or mean absolute error (MAE)? - arguments against avoiding RMSE in the literature," Geosci. Model Dev., vol. 7, pp. 1247-1250, 2014. Citations for references updated on 2019-04-21 14:32 in 172 seconds. Website conception, design and maintenance by Eugen COCA. Content updated on 28 Feb 2019. Site engine updated on 28 Feb 2019. This page was generated on the server in 0.108 seconds and loaded in your browser in > seconds.